Calling all Pillsbury members! 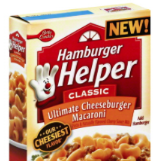 Hurry over to score a FREE Box of Hamburger Helper when you login for the first 10k. If you join today, you WILL NOT receive this freebie but you’ll be able to participate in future giveaways. Allow 6-8 weeks for delivery! Thank You! I look forward to trying the new flavor.